What’s the best news about Green Trends in 2015? Nearly every industry seems to be trending toward environmental responsibility, more companies than ever are setting up or adding to their in-house “greenprints” and most consumers are demanding green products and services at home and in their communities. 1. Urban farming. In response to the swelling demand for fresh, local food, expect to see integrated gardening projects becoming commonplace. People are beginning to reject the idea that farming is necessarily a rural pursuit. Community gardens are cropping up in the ever-increasing vacant city lots from abandoned home teardowns. Backyard chickens and goats are taking up residence as a result of eased-up city ordinances. 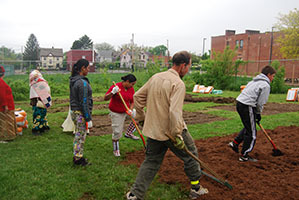 Food forests are taking root from increased funding and resources from community foundations and non-profits. In Akron, look for increased use of vacant lots in Summit Lake, West Hill and North Hill and around the Zoo for accelerated urban farming practices. 2. Increased sustainability in dining. The National Restaurant Association has identified sustainability measures as one of 2015’s hottest industry trends. Watch for more sustainable fish and seafood options, more responsibly-raised and free range meat and poultry served and more locally-grown ingredients added to major entrees. More restaurateurs will be partnering with local food advocacy groups to decrease food waste through composting, and conserving energy, water and other resources. In Akron, look for increase in food waste partnerships between locally-owned restaurants and coffeehouses and composters. 3. Demand for natural and non-toxic materials. Already trendy, especially when locally- sourced and increasingly health-conscious. Think zero-VOC paints, low-VOC carpeting and natural fiber insulation. Materials such as limestone, alpaca wool and local pine lumber are increasing in demand. More and more options for sustainably produced, socially responsible clothing and furnishings are all around us. We’ll see green lines from both high-end designers as well as moderate retailers like Target’s Tom’s collection and BeGood. In Akron, look for alpaca insulation available for home energy retrofits and increased consignment stores identifying natural materials and locally-made goods in their mix. 4. Living roofs and walls. These “lively” roofs and walls are becoming increasingly popular not only as green home features, but also cropping up as strip mall/commercial office building adornments. Besides conveying energy efficiency benefits and helping regulate surface water runoff, they protect a building’s interior from electromagnetic radiation. 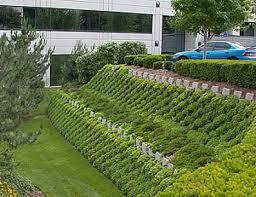 Green walls and roofs not only improve aesthetics, but also moderate temperatures around buildings. In Akron, look for a new terracing systems on hillside community gardens and living walls and green roofs on new and renovated commercial buildings. 5. Investment in greener homes. Smaller footprints and greener features ranked at the top of the trends list among NAHB survey respondents with 74 percent saying their next homes are smaller; and 68 percent saying their homes will get greener in 2015—far surpassing the other trends on the survey. According to Green Home Builder magazine, homeowners are ready and willing to live in greener homes even for extra money. Builders are rising to the occasion with more energy-efficient new construction and water-conserving plumbing without premium pricing. 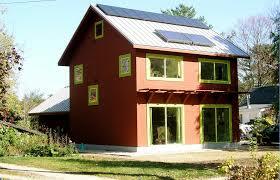 Net zero, water smart and passive houses are increasing in demand. With the increasing affordability of solar power (and even geothermal and wind) for individual consumers, this type of home is likely to explode in popularity over the next year. In Akron, look for a new Passive House to be built by new home developer and more efforts in solar panel and wind (in the form of windpod) installations. 6. Cargo and e-bikes. There’s a revolution rolling down our city’s streets, and its symbol is cargo bicycles and e-bicycles (aka electric bicycle using batteries–many solar-powered). E-bikes utilize electric–even solar– batteries to offer a boost when needed for pedaling up hills. These two new-wave bicycle types are the #1 health trend identified for families in ParentMap. Okay, the cargo bike is slow and heavy, but it transports several bodies on one vehicle and over-sized goods that once was the sole transport option belonging to the automobile. More than any development in the past few decades, these two bicycle transformations fulfill the promise of integrating bicycling into our daily lives. In Akron, look for bicycle grocery delivery service to be offered by non-traditional grocer and more bicycle commuters mounting e-motors on their rear racks. Posted on January 30, 2015 February 13, 2015 Categories Alternative Transit, community gardens, greenbuilding, Sustainable Landscapes, urban farming, urban revitalizationTags Akron bicycling, akron community, Akron sustainability, bicycle commuting, Community garden, energy efficiency, green business, greenbuilding2 Comments on What’s Trending for “Goin’ Green in 2015”? These are just a few of the things I heard in my community garden over opening weekend. It told me a lot about the people involved and the expectations of what the new Glendale Community Garden means to this community. Jan Green, Karen Edwards, Karen Starr and I spent a couple of cold, and blustery early spring afternoons canvassing the lower part of our West Hill neighborhood with flyers. Jan Green is a new resident of West Hill, and a retired nurse who grew up farming. Karen Edwards is a mom who owns some rental property near the garden and is a Farm-to-School teacher at a nearby Akron public school. Karen Starr is a mom, singer and local business owner of Hazeltree Interiors providing high quality home decor, interior design services and custom picture framing. The Glendale Community Garden includes18 family plots, a berry patch, herbal spiral, twin compost bins, a trio of rain barrels, ornamental Zen zone and more. 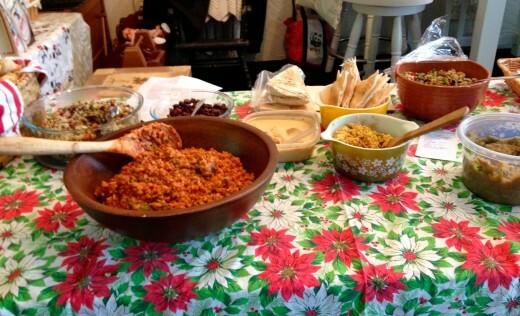 So far it’s proven to be a miracle of sorts for the neighborhood. It’s raising eyebrows, connecting area businesses and changing strangers into neighbors. Where else can retired grandmothers, girl scouts, I.T. nerds, firemen, soccer moms, hipsters, Gen-Xers, rappers and bohemians share a few laughs and get down and dirty together? What was once a cut-across vacant lot and occasional parking lot full of scraggly grass and gravel on Walnut Street next to the famous historic Glendale Steps (an abandoned WPA project from the depression era) is now a green urban oasis where pedestrians stop to relax, observe and smile a little. 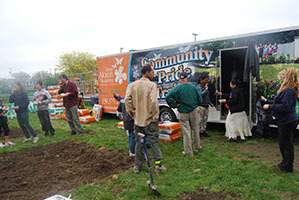 It all started a few months ago with permission granted from the vacant lot’s landowner, and seed money from NeighborFoods, a newly-formed organization overseeing the new crop of community gardens popping up by the dozens around Akron. A Facebook page went up, attracting local gardening participants, and initial planning meetings were held at Pure Intentions: The Wheatgrass Growers, hosted by owner Kathy Evans. Landscaper and neighborhood resident Jeff Copley worked the sod cutter prepping the 18 plots. Then, it was time for the garden’s Opening Weekend, May 9-11th. 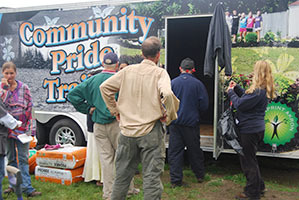 It started with the arrival of the Keep Akron Beautiful Community Pride Trailer laden with garden tools and equipment. 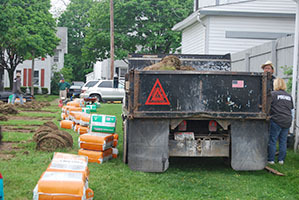 Canton Road Garden Center followed by dumping more than 200 donated bags of Pro-Mix soil additive. Then, chilling rains blew in, postponing the tilling until the next day. 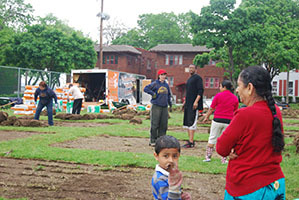 When the sun came out the next morning, more than 20 volunteers gathered to take on the dirty work, removing countless rolls of sod, tilling and cultivating the 18 -10’ x 15’plots and adding Pro-Mix and compost. Pat Arnold, the Pro-Mix soil rep, was on hand to instruct the gardeners on how to work Pro-Mix into the soil in addition to offering other valuable gardening tips. That afternoon, firemen from Fire Station #3 arrived with rain barrels, turned on their water hoses to fill the barrels, and helped heave the sod rolls into the haul-away truck. The owners of the 512 Fire Grill food truck who live across the street, fed hungry volunteers an authentic Puerto Rican-style lunch of empanadillas and alcapurrias, and provided lots of ice water. Urban farmer Alex Miller put up a twin pair of compost bins and Lisa Nunn, Director of Let’s Grow Akron, offered moral support, gardening guidance, got the nearby fire hydrant tapped and leant a colorful sign to welcome visitors and gardeners alike. Mary Dee from Asian Services in Action, arrived just in time to welcome three new immigrant families from Nepal who came with mustard seeds to plant. By the end of the day, all 18 plots were tilled, claimed and some even got planted. In the coming days, the Girl Scouts prepped the berry patch, bricks were laid for a community herb spiral, a group squash and melon field was started and ornamental flowerbeds guarded the entrance. Soon, St. Vincent-St. Mary’s 3rd and 4th graders will “grow a row for the hungry” by donating their produce to the Akron Regional Food Bank. 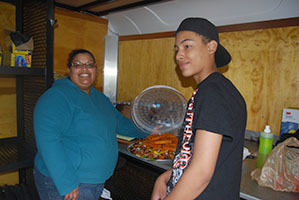 Come harvest time, the Salvation Army will open their kitchen and meeting space for food prep and preservation classes. The Glendale Community Garden is a grand new experiment for this long neglected neighborhood. In a few short weeks it’s already becoming a neighborhood miracle, joining a growing movement of over 5,000 community gardens in the U.S., according to the American Community Garden Association. Created out of organized chaos and tended by a lot of love and kinship, I have to believe our new Glendale Community Garden will do just that.